Corneal Collagen Crosslinking (CXL-UV riboflavin treatments). Topography-Guided PRK laser and therapeutic PTK laser treatments. CK (conductive keratoplasty using radiofrequency applications). 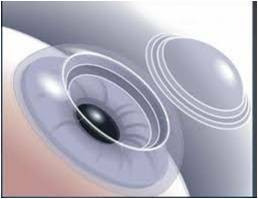 Corneal Transplantation (femtosecond laser assisted transplants, penetrating keratoplasty (PK), partial thickness lamellar keratoplasty (ALK), deep anterror lamellar keratoplasty (DALK). Superficial Keratectomy (SK) and excimer laser phototherapeutic keratectomy (PTK), used for treatment of corneal scars. Although keratoconus is a chronic disease, a stepwise treatment plan can get you the best longterm vision. Not all procedures are for everyone, but a tailored approach over time may combine a variety of procedures to optimize your corneal shape and visual outcome.